This new CML Infographic shows the three pillars that media literacy rest upon: Deconstruction, Construction and Participation. With new media, participation is a constant, where reading, writing and sharing and contributing and yes - participating - are all part of the equation, whether through visual, aural, digital or print media. The Five Core Concepts of media literacy (see http://www.medialit.org/sites/default/files/Media%20Literacy%20Concepts.png) inform a process of inquiry that can be applied to any media content – whether you are producing or consuming media messages. 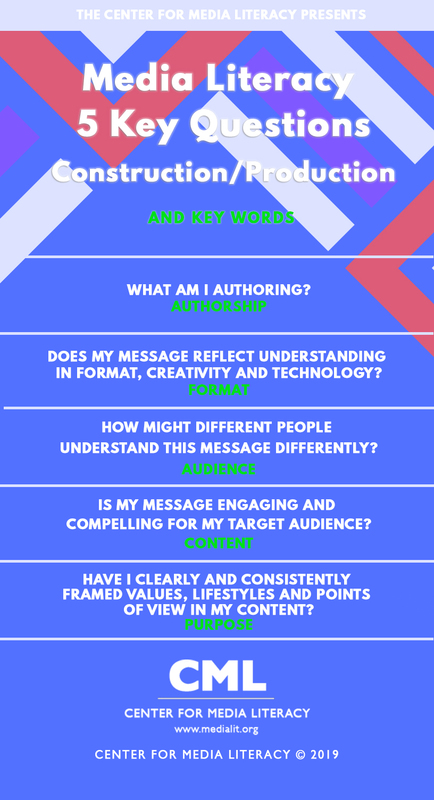 This new CML Infographic features CML’s Five Key Questions for Construction/Production (https://www.medialit.org/sites/default/files/5%20Key%20Questions%20For%20Construction.jpg ) – each associated with a Concept – to ask when constructing, or producing, media messages, regardless of whether those messages are disseminated on social media, video, billboards or logos. These questions are just a starting point for exploration – but they are a reliable starting point that provide a handy way to collaborate with others and zero in on key concerns for effective production. The latest CML Infographic depicts the Media Triangle, which shows our ongoing relationship with media – and today, we serve multiple roles as producers and users of media. Animated infographic version you can see in our YouTube channel - Media Triangle. "Roots of Digital Literacy" podcast from Southern Poverty Law Center's Teaching Tolerance series featuring CML's Tessa Jolls discussing the history and importance of media literacy education (Dec. 2018). Are You a Media Producer? Media Literacy is about consuming and producing media. Learn more! APHA Film Festival Features What is Media Literacy? In celebration of Global MIL Week and US Media Literacy Week, we are asking people: Why do you Commit2MediaLit? Thank you to Connecticut Public and TVSB for participating. Hear the voices of students, educators, and librarians. Please share infographics! Drag and drop or visit New For You page for more options. See our latest Connections newsletter "Institutionalizing Media Literacy Through Legislation." This issue Includes interviews about the newly passed legislation in California and Washington. National Media Literacy Week is November 5-9. Celebrations and activities are scheduled around the country. Find information at https://namle.net/publications/media-literacy-week-november-2nd-6th-2015/ to get involved.